Are your plants or soil waterlogged? There are many ways this can happen, but you CAN avoid losing your precious plants! What is waterlogging and why does it occur? Waterlogging is when the soil and root zone around plants becomes saturated. Basically, the water can’t drain away fast enough. This occurs when more rain falls than the soil can absorb or evaporate into the air. This can happen with an intense period of rainfall such as summer storms. You may live in a heavy rainfall area and have a seasonal problem. If you live on a slope and have neighbouring properties above you, you literally may have water flowing through your garden. Gardens and plants don’t only suffer from waterlogging as a result of extreme weather events. Overwatering especially in pots, poor drainage and heavy clay soils can also contribute to this problem. What Happens when Soil and Plants are Waterlogged? In healthy soil, there are lots of little air pockets around the soil particles. When these are saturated with water, the plant’s root tissues start to die off from the tips. The plant is starved of oxygen and carbon dioxide can’t move away. This can cause a toxic soil environment. If you are just having a seasonal rainfall problem, this is unlikely to occur, unless the soil is waterlogged for a long period. Usually the excess water finds a way to escape before this happens. It also depends on the type of soil structure you have. Heavy clay soils hold water for long periods as they have poor drainage properties. If your waterlogged soil is caused by factors like poor drainage or overwatering, your plant may eventually die. Carbon dioxide and ethylene gases can build up in the soil around the plant roots. These gases can negatively impact root and plant growth. Plants are also likely to become nutrient-deficient due to leaching. If your plants are starving, this can weaken them and they may attract pests and disease problems. Don’t stress though. You can identify if you have a waterlogging problem and there ARE solutions! Plant leaves may turn yellow. This may be due to nitrogen leaching out of the soil. The leaves may discolour in other ways. e.g. evergreen leaves may turn brown. Your plants start wilting, dropping leaves, shoots die back or leaves start to soften all of a sudden. Algae may start living on top of the soil in your pot plant or garden. Weeds like dock may appear. They thrive in an anaerobic (low oxygen) soil and arrive to help return health to your soil. Soil may start to smell ‘sour’ or become anaerobic. This is a clue the plant roots and aerobic microbes may be dying off. Water is pooling on top of your soil. 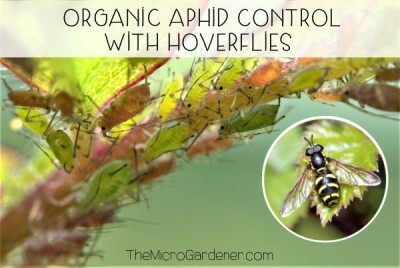 Your plants are being attacked by pests or disease. Worms are coming up to the surface in great numbers (they are trying to save themselves from drowning)! Look for birds suddenly appearing for a free feed. You might notice a scum or residue on the surface of the soil. If you lift your plant out of the pot or soil, the roots may be discoloured and a dark brown or black. They may be suffering from root rot. Your pot plants will show tell tale signs there is a problem with the soil or potting mix. How do you restore and clean up plants that may have been contaminated by flood waters? How do you revive plants that have been affected by heavy prolonged rainfall? How do you fix soil that is badly waterlogged? What can you do to prevent waterlogging in plants occurring again? I’ve had to have my own strategies for coping with subtropical weather events, so here are some practical solutions and techniques to help you. 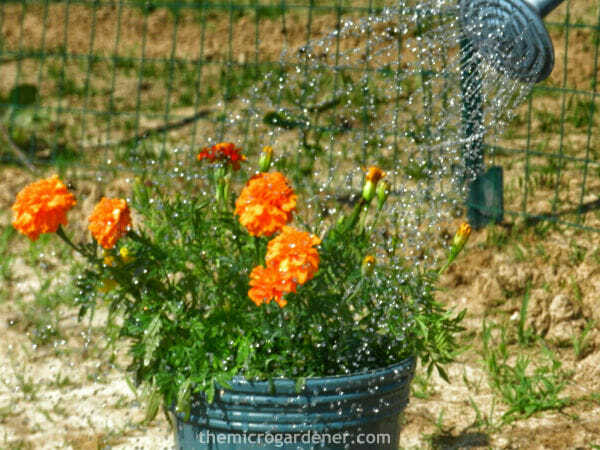 Firstly, hose off the plant foliage to remove any sludge or chemical residues. Use higher pressure for strong shrubs and potted trees and lower water pressure for delicate plants. Use higher pressure for strong shrubs and potted trees and lower water pressure for delicate plants. If the pot has accumulated sludge from the flood waters on top of the soil or mulch, remove it. Make sure you use gloves for protection in case of bacteria, chemicals or toxin residues. Bag this up and bin it. You don’t want this contaminating other parts of your garden or coming in contact with humans or animals. Next, scrub the outside of the pot and rim with warm soapy water. Use a safe biodegradable or environmentally friendly soap, not one with chemicals. If the pot surface is porous, it will absorb these and they may end up in the soil. It is likely the beneficial microorganisms and soil life that were living in your pot and keeping your plant healthy, have drowned. At best case, their numbers are likely to have been greatly reduced. If this is the case, the potting mix or soil may smell ‘sour’ or anaerobic. Oxygen normally fills the gaps in between the soil crumb structure. All organisms and plants need air to live. When plant roots start to decay, you may notice this unpleasant smell. If the pots contained edibles that are close to harvest, it may be best to avoid eating these in case they were contaminated by pollutants. If you don’t want to re-pot the plant and the soil is still smelly, you can try sweetening the soil. Add a sprinkling of garden or agricultural lime to help remove the odour. If however, you have a plant that prefers an acidic soil, then avoid this treatment. If you are prepared to re-pot your plants, then you can re-use some of the potting mix. However, add some other ‘ingredients’ to build up the health and restore aeration. Ideally, remove any contaminated potting soil and put it through a hot composting system. This should remove any pathogens.Make sure you use gloves and a mask when mixing up the soil. Add equal parts of fresh compost, worm castings and if possible, vermiculite to retain minerals and aerate the potting mix. Grade 3 Vermiculite (a puffed natural mineral called mica) is a good size and helps aerate plant roots. Alternatively use a coarse washed river sand available at landscapers for very low cost. Remove any dead or dying shoots or foliage with clean secateurs. Pay attention to tool hygiene. Ensure you wash your tools in warm soapy water if they have been used on sick plants. 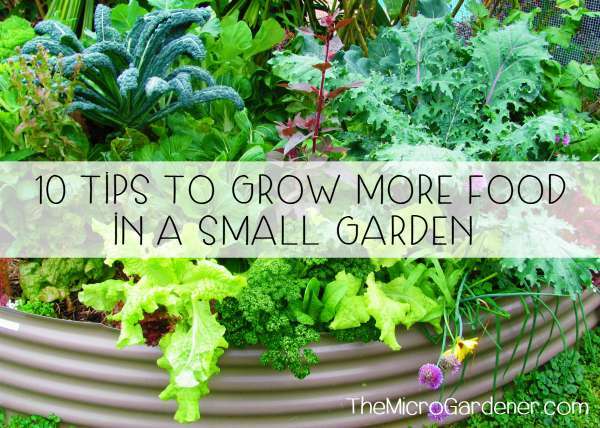 If you are not re-potting, you can add beneficial microorganisms back into the soil. Gently fork in some fresh compost and/or worm castings into the top layer of the pot. Try not to disturb the roots of the plant. Then ‘feed’ them with a drink of diluted molasses and seaweed or kelp. Molasses is a thick black liquid that is basically a simple sugar that beneficial soil bacteria go crazy over at their ‘dinner table.’ It is usually sold cheaply at health food and garden produce stores and is a great investment in soil and plant health. A capful in a watering can is all that is needed. Follow the directions for the dilution of the seaweed/kelp. Once the microbes have some food, they will have enough energy to start to multiply and get to work in your pot or soil. They will soon help restore the pH balance and plant health. Repeat this treatment every 2 weeks until the plant recovers and soil health is restored. 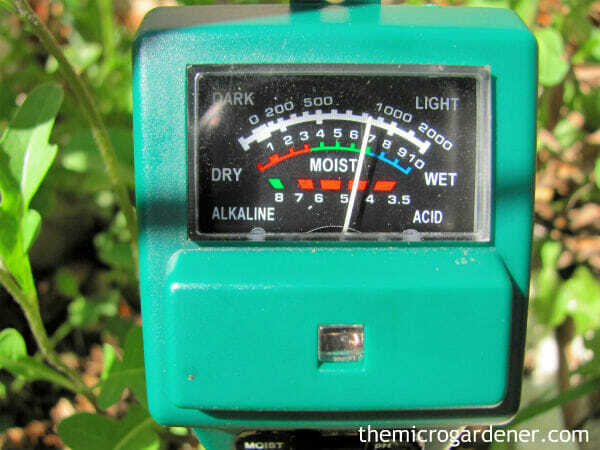 Use a moisture meter to measure how much water is still in your soil. Moisture meters are a valuable diagnostic tool. If the soil moisture measures above 80%, it is still too wet, so let it dry out before adding any more water. The ideal moisture level is between 40% and 70%, which allows some oxygen to stay in the soil. Water when the soil moisture drops to <30%. 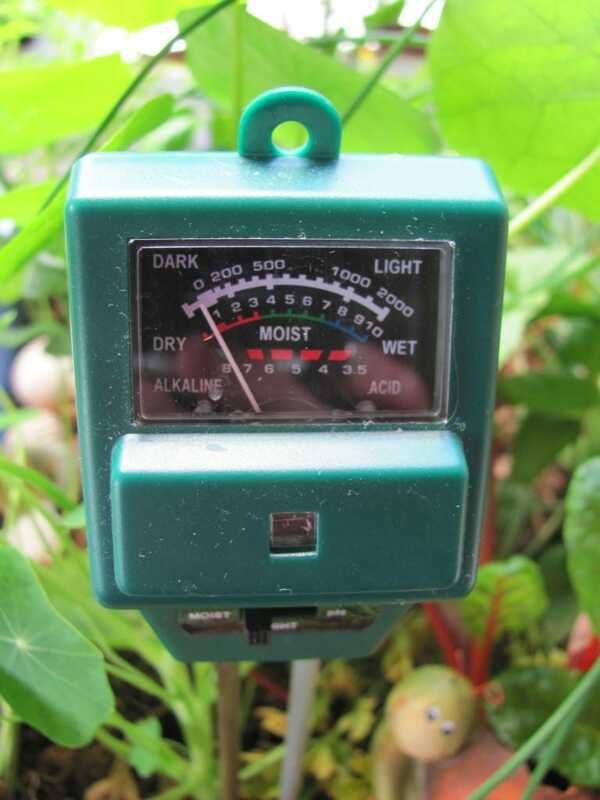 Moisture meters help you know when your plant needs watering and when to leave it alone! 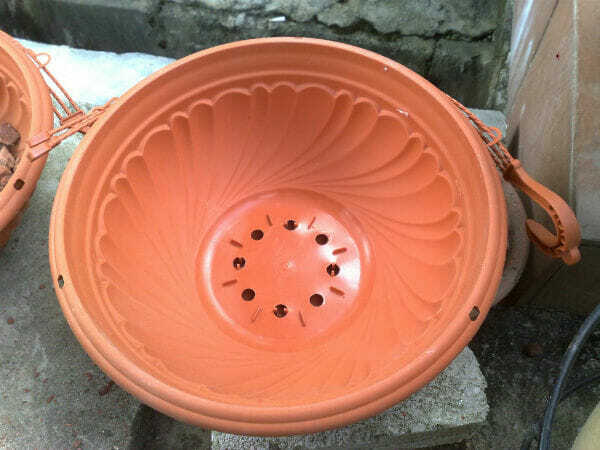 Finally, check the drainage holes at the base of the pot. Make sure the drainage holes are free of roots or blockages so water can drain away freely. If your pots get waterlogged frequently, consider drilling more holes in the pot or transplanting into a more suitable container. You can also add some fine mesh like flyscreen to the base of the pot to prevent the drainage holes becoming blocked. Or put the pot up on feet or a portable trolley to enable water to drain freely. A waterlogged soil is not a healthy environment for plants to live. Much like we would not be comfortable living under water all the time. We need to come up for air and the plant roots need oxygen too! When plant roots sit in excess water for too long, they start to rot or decay. As the roots deteriorate, they can’t take up water, so the plant wilts. This is the same symptom of a plant that is thirsty! So you need to look for other clues to avoid accidental waterlogging in plants. Be aware that water sitting in pot saucers can also cause problems. It’s also a mosquito breeding ground. Self-watering pots are a great solution for keeping the soil moisture where the plants need it, while allowing excess water to get away. Resist the urge to water your plant too often. It can actually make things worse! Waterlogging in plants and soil compaction can create ideal conditions for diseases such as phytopthora and other fungal attacks. 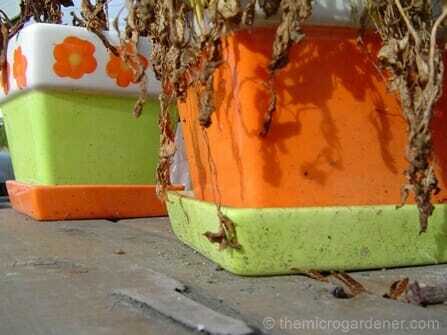 Use a good quality potting mix that holds sufficient moisture but allows it to also drain freely. A healthy soil mix will also have lots of air pockets. If the pot or container feels heavy and the plant is still wilting, excess water may not be getting away fast enough. 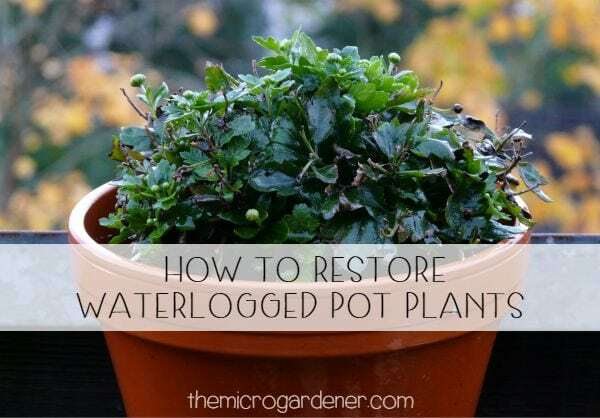 A common cause of waterlogged pot plants! If you have already drilled enough holes, you may need to actually remove your plant from the pot to save it. Spread out a number of sheets of newspaper in a tray. Lay the pot on its side and gently slide out the plant’s root ball. Allow the root ball to dry on the newspapers for about 12 hours. Using clean sharp scissors or secateurs, trim off any dark-coloured (brown rather than white) or slimy roots. When you are finished, re-pot the plant in a clean container with some fresh potting mix as already outlined. Most books and websites on container gardening recommend the addition of coarse material. For example: gravel, sand, pebbles, pottery shards or polystyrene pieces. They claim adding this to the bottom of a pot will improve drainage. Pot plants that have been inundated with water will also have likely leached out much of the plant food or fertiliser that was in the pot previously. 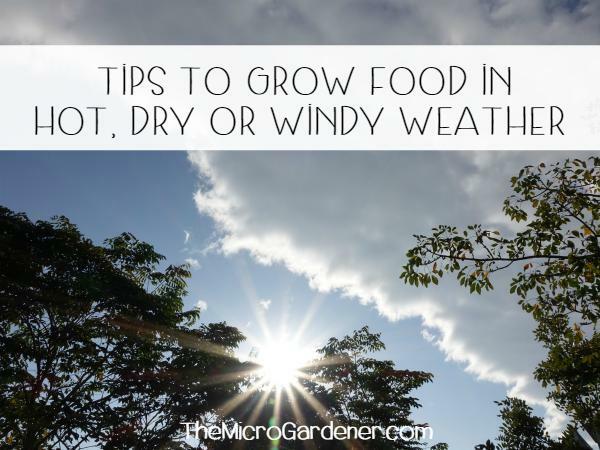 You will need to replace this food source with some more organic fertiliser to ensure your plant has the energy it needs to regain its health. 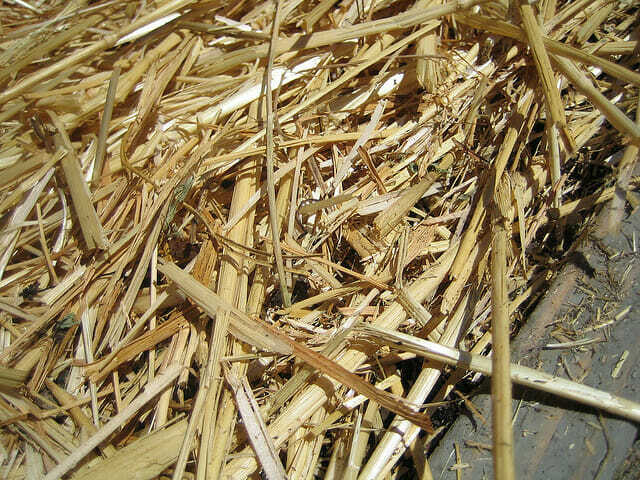 Top up with mulch too. If you notice discoloured or yellowing leaves, this is often a sign your plant is crying out to be fed. This is because it is missing essential minerals in its ‘diet!’ A slow release, powdered or pelleted organic fertiliser and compost can help restore the nutrients. If the ‘plant patient’ is really suffering, a foliar spray (on both the top and underside of the leaves early in the morning with kelp/seaweed), will give it a quick ‘pick me up.’ Use a spray bottle for this. See Frugal Gardening: 5 Thrifty Recycling Ideas on how to get one for free. 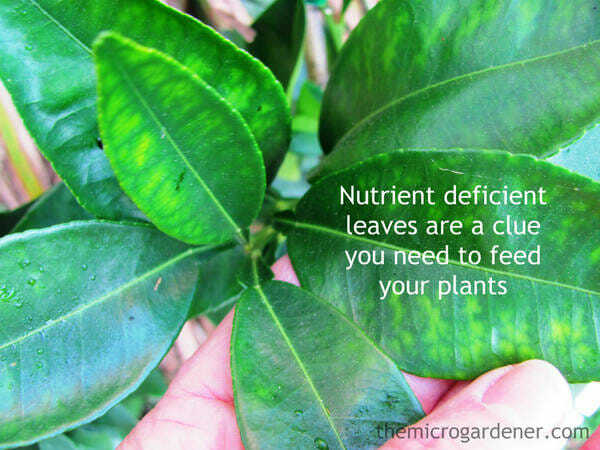 Discoloured leaves can indicate a mineral deficiency in your plants. 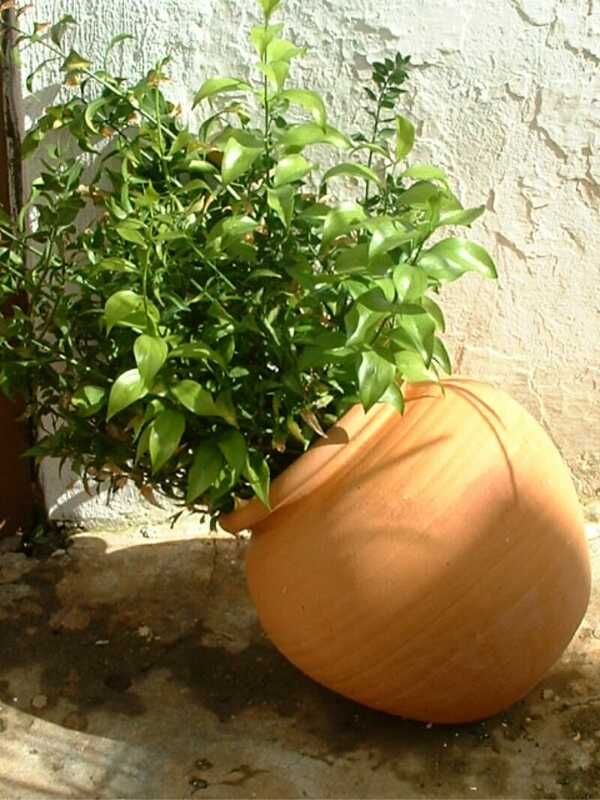 To minimise future waterlogging from heavy rains and storms, consider moving your pots to a more protected position. 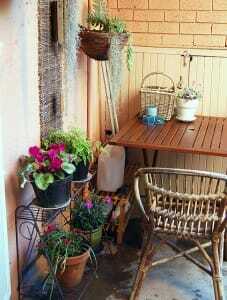 Under an eave on a veranda or balcony is ideal. Add a layer of mulch to the top of your pots. This also stops valuable potting mix from splashing out of the pot and provides a buffer between the soil and the water. 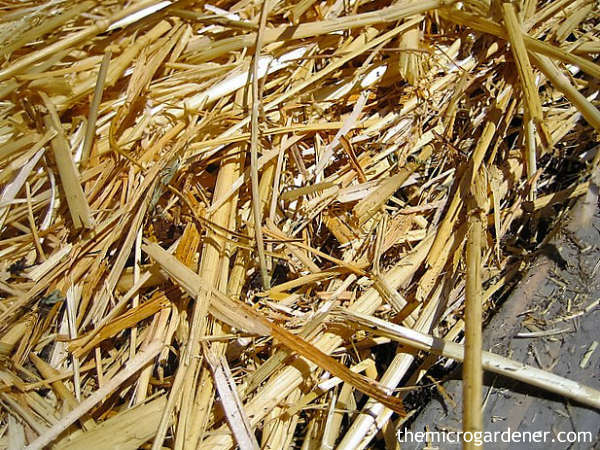 There are a wide variety of mulches you can add to pots to buffer the effects of the weather. If you live in a high rainfall area and your plants are constantly getting swamped, consider working with nature – not fighting it! Start again with water loving plants that thrive in wet conditions. You’ll have less work to do in the garden as a result and have more success. If your garden has escaped being flood, storm or rain affected, now may be the time to take a few cuttings and share them around with neighbours, schools or community gardens that suffered damage. No doubt they will be warmly appreciated. Starting over from scratch can be very disheartening, but when seeds are replanted and others offer help, the task doesn’t seem as daunting. For more problem solving tips, find out how to re-use old potting mix rather than throwing it away or make your own with my easy DIY potting mix recipe. I planted a kaffir lime tree in a big pot for few years. Then i started to put on top of the soil with orange peels frequently. But last few days suddenly it has water clogged and the leaves started to dry out and falls. I notice there some oil slick from the bottom the pot. What actually happened and can i still save the plant? Thank you for your kind reply in advance. Just follow the steps in this article to remove your plant from your pot and refresh the mix. 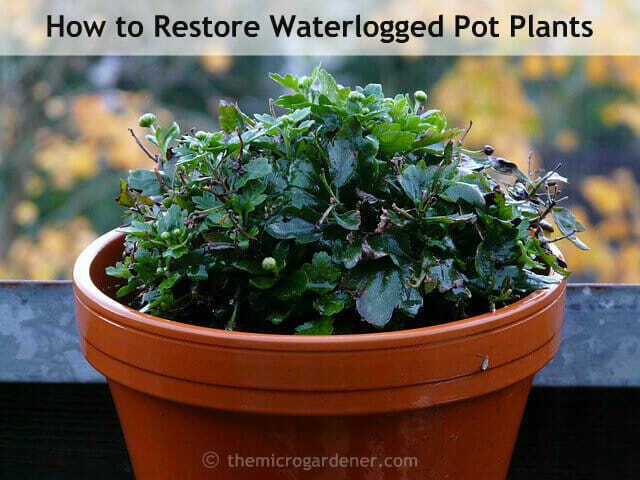 You may need to prune off the dead foliage and trim the roots which may be blocking the drainage hole in your pot. Perhaps choose a larger or different pot with better drainage. That should help it recover. Good luck. I believe some potted plants I am babysitting are waterlogged. I was told to water them every other day and give them plenty of water because the house is 80F. I cannot repot these plants. What can I do? These plants are important and I’m really concerned. 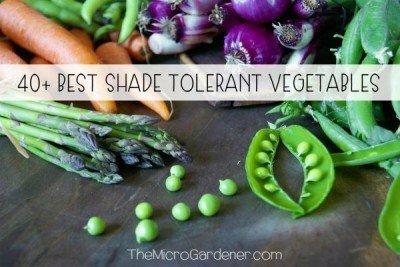 I suggest you follow the advice in this article and perhaps put them outside in the shade to drain well. Stop watering them until the plants recover. A foliar spray with seaweed may help. Overwatering is far more detrimental to plants than underwatering. I bought compost bags online for cuttings/ repotting. All cuttings I’ve planted are waterlogged. The water pool sits at the top and very slowly trickles its way down. I added perlite to one pot but that didn’t help. Am I supposed to pre soak the compost? I thought I was compacting the soil too much when potting but same problem for the pot in which I loosely dropped the compost around cutting. I don’t understand what I’m doing wrong. The composts are non peat based. I am in London, UK. Any tips welcome. Thank you. Hi Anne, I planted 6 strawberry plants a few weeks ago in a 5 gallon bucket, which I turned into a vertical garden. I used the potting mix you suggested but have lost 3 already and 2 others are going brown. I repotted 2 in the top of the pot as they did nt seem to like being at the bottom of the bucket. It’s been pretty cool in the evenings up until the last week, when Spring has definitely sprung and it is still dry here so I water them every day. What am I doing wrong – does my potting mix need more river sand? My daughter gave me a gift hydrangea, Blueberries & Cream plant. It was beautiful. Unfortunately, I am not good with plants. It started to lose flowers, wilt so I added more water. After several days, I emailed a Company that sold this type of plant and was told to stick it in a bucket of water overnight. That improved it greatly, then a few days later it started drooping, but the soil was still very wet. I put it outside for some sun, but still didn’t improve it. Anyway, now leaves have shriveled, dry (but soil still wet) so I trimmed all the dead off hoping it would help. The stems are still green half way up the stem. The bottoms have a tan covering but not sure if that was like that when I first got it. Can you tell me what else I can do or is it almost dead? Can I email you directly and send you pictures? Any help you can offer would be greatly appreciated. Thank you so much. Hi! I recently bought a potted parsley plant, and placed it on my porch in sunlight. Unfortunately, we had a rough storm this morning, and my parsley plant was trampled by water. The shoots with leaves no longer stand straight up, but flop over the side of the pot. I very much want to be able to save it if possible- do you have any recommendations? I can provide pictures as well! Heavy rain can damage plants – sometimes bruising the cell walls if they really get a pelting downpour, but don’t worry. Your parsley WILL bounce back. It’s an extremely resilient herb! Hail does more damage than rain and can smash leaves to pieces in minutes. If I know a potentially damaging storm is coming, I keep an eye on the weather online and move my potted plants under cover. The rain with all its wonderful minerals will likely do your parsley more good than bad, despite it looking like its taken a beating! A light foliar spray of liquid seaweed/kelp on both sides of the leaves will help it recover more quickly. It’s likely by tomorrow, nature will have taken over and the plant will look much better all on its own. Pop it back into the sun to dry out a little too. If any leaves or stems are broken, just snip them off to encourage new growth. Hope this helps! I have, and now feel as though I will have had, a wollemi pine in a pot. The plant is showing signs of unhappiness-wilting. Should I hose off the soil and repot it as soon as possible? The plant was a gift from a relative now deceased and I would be distraught at losing it. Hi Juris – thanks for your question. Don’t despair just yet! Wollemi pines are quite hardy plants. There’s a good website on caring for Wollemi pines in pots @ http://www.wollemipine.com/care_information.php#potplant. Hope this helps! Let me know if you have further questions. With the emails and photo you sent me, I know you’ve had a hard time with this waterlogged pot plant! It’s made more difficult because it weighs so much and is so valuable and you don’t want to lose it. Did you try foliar spraying it with seaweed as I suggested? 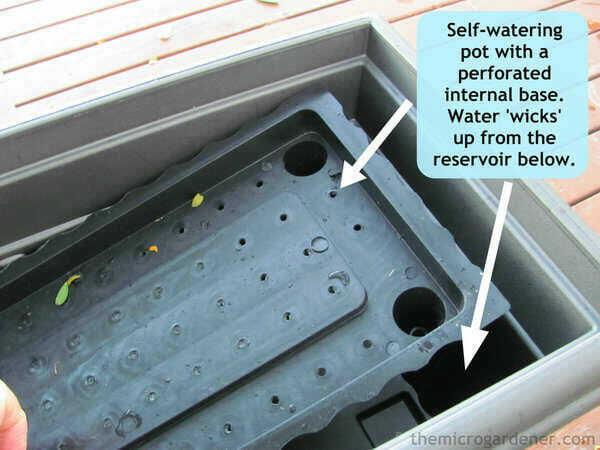 My main concern remains the same – if the pot is still wet then even though it has holes drilled, you may need to check the roots are not blocking the water from escaping. It MUST drain freely or you have no chance of remediating the plant and soil. You can kill a plant with TOO MUCH water – drowning a plant is one of the most common mistakes gardeners can make. If a plant is wilting it’s often assumed a plant needs water but the reverse can also be true. A plant can wilt if it’s had TOO MUCH water. Continuing to add moisture only makes matters worse because all the oxygen in the air pockets in the potting mix become saturated and the plant root hairs can’t breathe – much like us gasping for air under water! We wouldn’t last long if we couldn’t get air into our lungs and a plant’s ‘lungs’ are its roots. If the pot is out in the open and it is continuing to rain on it you will need to take protective action to prevent this somehow until the moisture levels reduce, however if it’s on your balcony or under cover then you can control the moisture it gets. The whole plant seems to be very brown so to make it easier to remove it, perhaps you could consider pruning it back tightly. This will reduce stress and if you can get it out of the pot, use this as an opportunity to add fresh potting mix with plenty of compost and microorganisms in it to help the plant recover quickly. You can also spray the root ball with a strong solution of seaweed to act as a ‘Rescue Remedy’ tonic. – I HAD HOLES DRILLED IN THE POT. – I DO NOT SMELL AT ALL ANY BAD SMELLS AND I HAVE CHECKED THE MOISTURE OF THE POT AND IT IS STILL WET. – I DID NOT PULL IT OUT OF THE POT BECAUSE IT’S SO BIG. But if your advice is, so I will see if I can round up some man to help me. Awaiting your reply and thank you . I WILL SEND YOU A PHOTO. ITS 12.15 IN THE MORNING AND AM STILL GOING THROUGH YOUR GARDENING LIBRARY (I CALL IT) YES I ALREADY ASKED MY HUSBAND TO DRILL THE HOLES. I CANNOT SMELL ANY BAD SMELLS . I love passing time (it’s meditating to me) reading your articles. But this time I have a problem and am in a state of the unknown. I have a magnolia that is in a pot and was doing wonderfully well. Then I was watering it and so was my husband and it became waterlogged. I to be honest noticed from the leaves because the tip of it is covered with cacti and I did not see the water in the pot. I lifted the pot but the tree has the leaves that turned brown. Do you think I can save it? I read your article but still I am not sure what to do. I would be grateful if you have time to help me. I just look at it not knowing what to do. It’s in a big pot made out of terracotta. Sorry to hear of your magnolia woes. I’m not sure how long your plant has been like this and without a photo it makes diagnosing a little difficult as I’m not sure what you mean by ‘cacti’ on the leaves. In any case, I am guessing but it sounds like you could possibly have an issue with drainage in that pot if the water is not running freely out. A very common problem is the roots become matted in the hole in the bottom of the pot and block water from draining out. Terracotta pots tend to only have one hole and I’ve had to get my husband to drill extras in ours around the sides to let the water out so this very situation doesn’t occur with my own potted trees. This is my first suggestion – let the water out. Tip the pot upside down if it’s not too large (use a blanket on the ground so it cushions the side of the pot) or rest it on its side and let the water drain as much as you can. If the soil is smelly then it has probably become anaerobic which means the good soil bacteria and microbes have likely drowned due to no air pockets left in the soil. You may need to remove the magnolia from the pot, trim the roots back and with a spray bottle, add a strong solution of seaweed – spray the root ball and leaves and prune the tree back while it is under stress. Give the root ball time to dry out and repot into a WELL DRAINED container with fresh compost and potting mix as soon as possible. If you can email me a photo that would be great otherwise this may help remedy the situation. Good luck! Thank you Anne – what an amazingly full on response! I have learned so much from you answering my question on bananas! They are truly a wonderful adjunct to frugal gardening too. I am going out into the garden now armed with my banana peels and seaweed solution to not only look after my staghorns but my other plants as well. If you have any extra information on how I should plant out two pots of a lovely purple hydrangea I would love to have some help there too. No hurry though! Hydrangeas are such a popular plant in so many gardens, I have answered this question in a new post called How to Grow Hydrangeas. Hope you get lots of flowers and enjoyment from your new plants. Let me know how you go! Thanks for raising this question. Feeding banana peels to staghorns and other ferns is not an old wives tale – there is are valid reasons why many people use this DIY fertiliser! Staghorn and elkhorn ferns are epiphytic perennials or “air” plants. 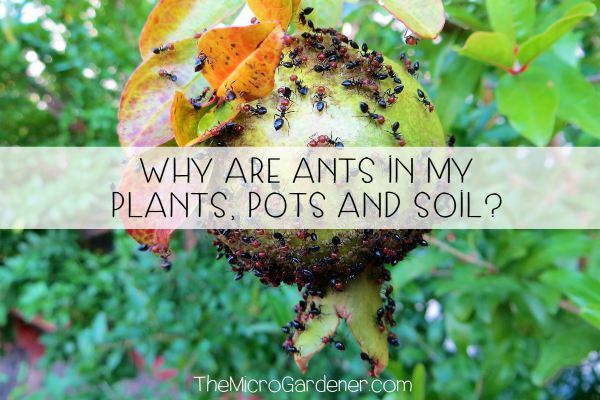 Because they don’t make contact with the soil, they get their nutrition substantially from the air! Quite an amazing concept! Bananas contain a relatively high level of potassium that helps displace sodium that can be harmful to salt-sensitive staghorns and they have many other benefits too. •	Potassium – helps promote general plant vigour; helps build up resistance to pest & disease; necessary in fruit development; is involved in regulating around 50 enzymes in a plant and relates to the turgor (or uprightness of stems and the thickness of cell walls) i.e. plant strength! Extremely important for staghorns which literally hang onto tree trunks in nature. •	Phosphorus – strongly influences fruiting and flowering, essential for good root and shoot growth, pollination and is very important in seed germination/viability. •	Calcium – the most important mineral in the soil and known as the ‘Trucker of all minerals,’ is the ‘ingredient’ of cell walls concerned with root development and growing stem points and helps ‘open up’ soil to allow more oxygen. With such important roles to play, these macronutrients are vital for plant health and wellbeing but there are many others that are needed too so a balanced slow release granular organic fertiliser with other trace elements will supplement those not present in bananas. These types of fertilisers are usually in a fine powdered form that quickly dissolve and become plant available. Sprinkle into the foliage basin in the middle of the fern. Seaweed or kelp liquid organic fertilisers also supply your plants with loads of macronutrients and kelp also helps build pest and disease resistance. A regular monthly foliar spray on the upper and lower side of the leaves early morning will keep your staghorn in good health. So back to the bananas! •	Banana Water: Soak a fresh banana peel in water for a day or two – then use the water with the leached nutrients in it to water the staghorn. Don’t let the peel go to waste though! Chop up the peel and add to your compost, worm farm or dig it into the soil around other plants to build up the organic matter and attract worms. •	Chopped Dried Banana: If your staghorn is indoors or close to the house and you are worried about the banana peel attracting fruit flies, then you can dry out the chopped banana pieces in a slow oven and then use them or put them out in the sun under a strainer to dry out for a day or two. Scatter dried banana pieces in the centre of the plant and water them in. You can also mix them into the moss if you are replanting or starting out with a new staghorn fern. Each time you water or it rains, they will provide slow release nutrition. •	Banana Peel on Trunk or Backboard: Put a whole banana peel between the staghorn and the backboard or tree trunk it is supported on. By placing it in this position, the banana peel will gradually decay and slowly release nutrients when the plant is watered or it rains. •	If you have bananas you won’t use up (whole or just the skins), don’t waste them – freeze them! When you have time to work on your garden, defrost the banana, chop it up into smaller pieces to increase the surface area for faster breakdown and dig into the soil around the base of your plants. •	Alternatively, store peels in a self-seal bag in the fridge until you are ready to use them. Ideally, sprinkle some bokashi grains onto the chopped up peels so the breakdown process is already getting started. •	Spray the chopped up banana and/or peel with diluted seaweed or kelp – this provides additional ‘food’ for the microbes that will help break down the fruit faster so the nutrients can be absorbed by the plant as well as adding valuable nutrients. •	Use with other homemade fertilisers such as crushed eggshells and coffee grounds for greater effect. •	Use bananas (whole/peels) as a soil amendment. They are a rich source of organic matter so they add valuable minerals and the decaying organic material attracts beneficial microorganisms (microbes) and earthworms which help create air pockets in the soil and add their free fertiliser (worm castings). Hope this answered your question and helps you get the most out of your plants and bananas! Check out ‘DIY Fertilisers – How to Use Banana Peels’for more tips on how to feed your plants. Hello, love your blog….it’s the best. Please could you answer a question for me. I think it was my mother that told me to put banana skins on to staghorns, elkhorns etc and that it would be nutrition for them and help them to grow.